Twenty thousand kilometers and still on the road. 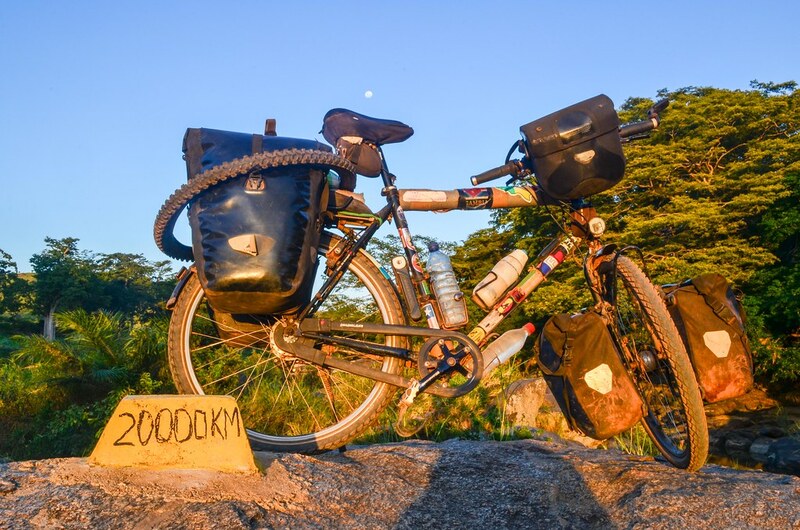 Angola is a cycling paradise, with stunning landscapes and many brand new (Chinese) roads. Yet, avoiding the traffic and the very expensive cities, I managed to “cycle” 60 km on stones and sand to join Golungo Alto from Quibaxe and pass the 20000km milestone in the middle of nowhere. After 500 km into the very big country (more than twice bigger than France), my portuñol is good enough, the blue sky is back, as well as infamous roller-coaster mountains making me often push the bike under a harsh sun. If it continues (the maps say so) I will end up with arms as strong as my legs.